The North Jersey History and Genealogy Center has completed a six-month project to preserve its frequently used microfilm collection of the Morristown Daily Record, which was beginning to exhibit signs of vinegar syndrome. Thanks to the generous support of the New Jersey Historical Commission, the Library transferred the susceptible reels onto archival-grade polyester film, with backup copies made for offsite storage. History Center staff performed quality control checks on each of the 374 reels of the newspaper that documents Morris County life from 1900 to 1974, and the Daily Record is again available to researchers. The papers of beloved children’s author, Kathryn B. Jackson were recently acquired by the Library. Kathryn and her husband Byron wrote scores of books for Simon and Schuster’s Golden Book series, including the Saggy Baggy Elephant and the Tawny Scrawny Lion – both of which appeared in the Macy’s Thanksgiving Day Parade. Following Byron’s death in 1949, Kathryn continued writing children’s books until 1955 when she rose to the position of Senior Editor for Silver Burdett Textbook Company and eventually moved to Scholastic Magazine in 1960. The papers reflect both her professional and personal life from the 1930s through 1984, and include family photographs and documents dating back to 1901. The Kathryn B. Jackson Papers were processed by Archivist, Jeffrey V. Moy, and are currently available to researchers. 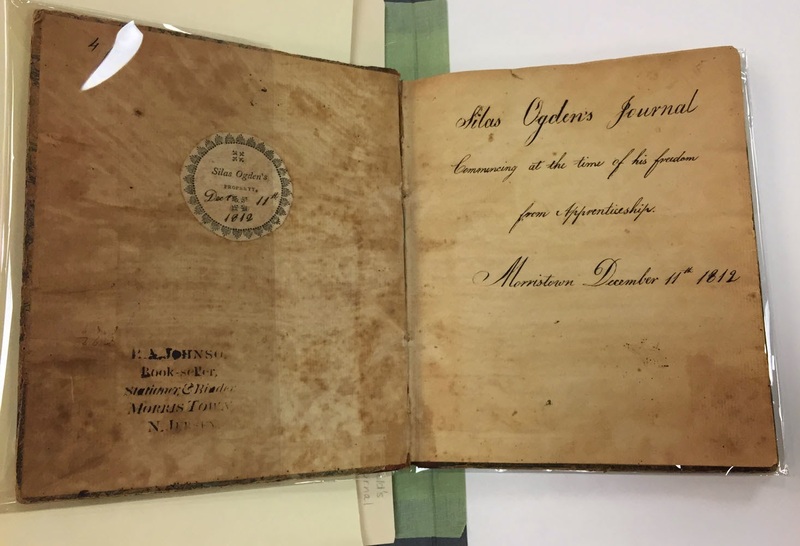 Silas Ogden’s journal starts on December 11, 1812 with an entry noting the end of his nine-year apprenticeship to Silas Mills as a tanner; during his training Silas would only see his parents once and Mr. Mills eventually regarded him as a member of his extended family. Nevertheless, Ogden managed to remain close with his parents and eleven siblings who he immediately set out to visit and assist with a number of business propositions. 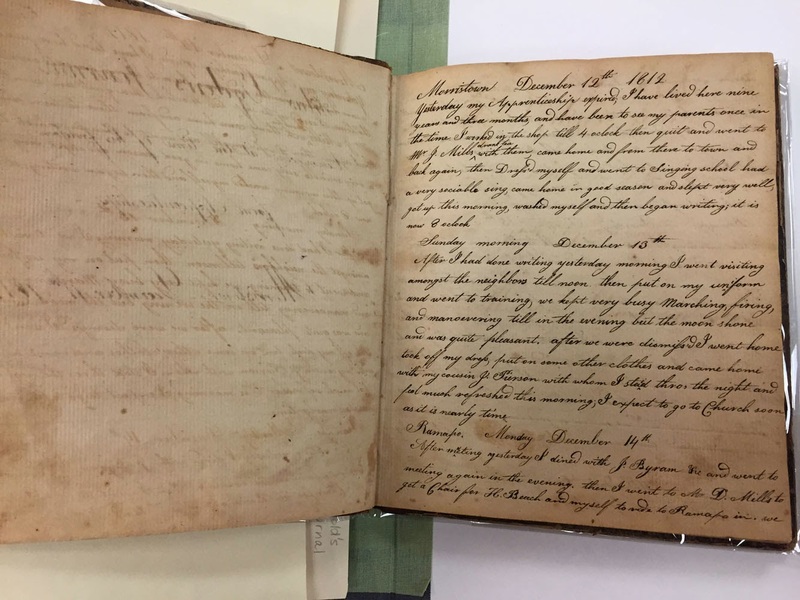 The journal recounts Ogden’s military training (during the War of 1812 he was a Fife Major in the First Regiment of the Morris Brigade), social engagements with several Morristown families, travels across the state on horseback and by foot, and other aspects of day to day life in early 1800s America. The Silas Ogden Journal was recently cataloged and is available to researchers in the reading room. In celebration of Morris Township’s 275th anniversary, the Morristown and Morris Township Library will host a special exhibition opening this March. Utilizing rare photographs and documents from the Library’s collections, the exhibit will spotlight the Township’s pre-colonial roots and Revolutionary War heritage, growth from an agrarian to high tech economy, as well as its many Gilded Age estates, its natural resources, local government, and a section devoted to little-known facts. Organized by the staff of the History and Genealogy Center, the exhibit is scheduled to open in mid-March and will run through August. yet ready to donate them to the library. However, the binder of high-quality printed versions of the digitized cards became a popular stopping point at the library’s front desk after some local press coverage. When Herman came in to lend the library his postcards, Herman began telling me the most interesting stories about the scenes on the cards and the town itself. When I asked him if he’d be interested in being recorded on video talking about these subjects, he enthusiastically agreed and signed the requisite forms. He also was very interested in the prospect of talking about the cards for an exhibit featuring the cards. Herman sat for me each week in October and November 2014, usually for 1 to 2 hours. I brought in my home video equipment and recorded him in my office. He talked about the cards for the first few weeks, then we had more traditional oral history discussions about his family and experiences in Chester. He later brought in older photographs and his 50th wedding anniversary photo album to talk about and for me to make digital versions for our collection and exhibits. When I began editing the videos, I thought about the audience – our online patrons. Because postcards are short letters, it made sense to keep the videos short as well. Herman is a natural at these videos and kept most of his discussions to a few minutes. Some of the videos are a bit longer because he would remember a related topic and talk about it. I kept most of these in the online versions because they were so interesting. Since January, I have had a Friend of the Library volunteer, Ellen Speicher, transcribing the online videos to increase the accessibility of the content. He was her plumber, too, and she has told me each week how much she has enjoyed this work. Link to the videos: https://www.youtube.com/channel/UC2wfelLw5pFoG1hzuv9t1EA. Because Herman enjoyed his experience so much, he donated his The Mendham-Chester Tribune newspaper collection to the library. This collection fills a much-needed hole in the library’s offerings. Prior to Herman’s donation, the library had Observer-Tribune and its predecessor, The Mendham-Chester Tribune newspapers dating back to 1955. Herman’s collection ranges from 1936 to 1939 and includes the very first issue. rehousing of the papers, and was very pleased when the library received the grant from the Commission. The newspapers were digitized in February, and are now available on the library’s computers. Benjamin Franklin once described New Jersey as “a barrel tapped at both ends” because of our location between the two imposing metropolises of Philadelphia and New York City. We’re the Crossroads of the American Revolution for that very same reason. Forget the six degrees of separation, chances are good that every important event or person in U.S. history can be linked back to Jersey in about 3 or 4. We’ve been divided into East and West, and over whether we call it pork roll or Taylor ham. We’ve been the punchline to countless jokes, our politicians are loud-mouths and our taxes are high, but we’ve birthed many of the greatest musicians, actors, inventors, and humanitarians. Our roads might be congested, but we can boast some of the best beaches, mountains, and even water falls, and we don’t have to pump our own gas. Oh, and we even have our very own Jersey Devil. March 2015 had been designated as the month of the New Jersey Caucus, but we stepped aside for announcements related to the Boston meeting. Now that it’s quiet, we’ll take the next few days to tell you about us and some of the things our members are doing. New Jersey has a strong and active caucus of 108 members. We present our Innovative Archives Award to an organization that has furthered the cause of archives and history in the state, and we co-sponsor the Paul Stellhorn Award which recognizes exceptional undergraduate papers in New Jersey history. The caucus chair sits on the boards of the History & Preservation Section of the New Jersey Library Association, the Advocates for New Jersey History, and the newly created New Jersey Cultural Alliance for Response. The members that comprise the caucus are seen as vital participants in the state’s library, history, and archival communities. Our biggest contribution is the Caucus Archival Projects Evaluation Service (CAPES) Program that just celebrated its 25th year. Funded by grants from the New Jersey Historical Commission, CAPES has provided free professional care and guidance to small to mid-size repositories of archives, historical records, and manuscript collections. Consultants assess and recommend improvements that will guide institutions’ strategic vision in setting goals, program priorities, and budgeting. CAPES consultations collectively have helped to raise the standard of archives preservation and access in smaller institutions in New Jersey through the more than 450 surveys that have been completed. Recently, the CAPES Advisory Committee has been working with the New Jersey Association of Museums to establish the Artifact Assessment Program (AAP) which will do the same thing for artifacts that CAPES does for archival items. At the New Jersey Forum at Kean University in November 2014, CAPES was presented with a Special 25th Anniversary Award. 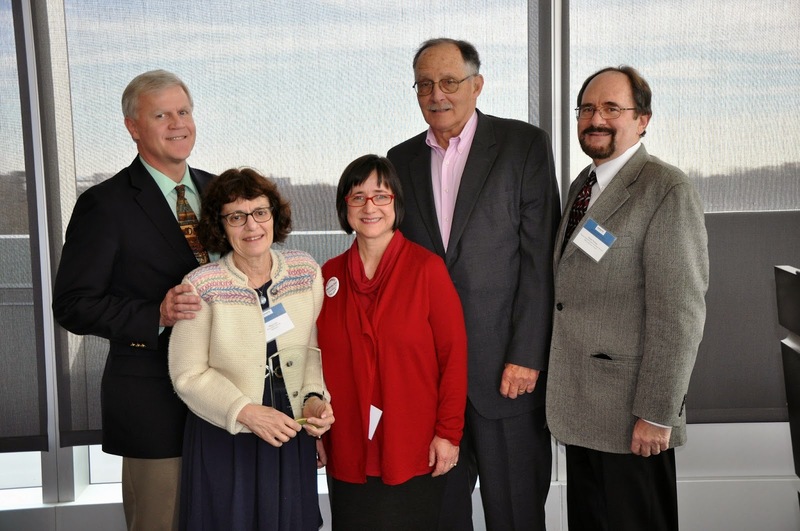 In the photo are three of the founding members of the CAPES program, Karl Niederer, Maxine Lurie, and Richard Waldron, with NJHC executive director Sara Cureton (in red), and current CAPES coordinator Frederic Pachman (on right). Archivists across the New England and Mid-Atlantic regions are finalizing the details of their plans for our joint meeting in Boston this week and revving up for what will be the biggest and most collaborative regional meeting many of us have ever seen. Some of us will recognize each other from SAA or other national organizations, but for a lot of us this will be a first opportunity to make connections outside of our respective regions. While the meat of the meeting–the phenomenal sessions that are in store*–will provide a fantastic opportunity to get to know each other, what else can we do to make sure we make cross-regional connections? My suggestion? Attend the reception on Friday, March 20, in the Georgian/Arlington room from 5:00-8:00 pm. This will be an excellent opportunity for all archivists in attendance to catch up, discuss Friday’s sessions and plenary talk, and/or get to know each other over drinks and snacks. Starting at 5:45, NEA and MARAC attendees will have the chance to team up and take each other on in a friendly Pub Quiz, emceed by your friendly Program Committee members Frances Harrell and myself. The questions will cover a wide range of archives- and revolution-themed topics, and teams will have opportunities to wager and earn extra points throughout the competition. Teams will consist of up to 4 players, and we will award bonus points to all teams that have two NEA and two MARAC participants. Teams finishing in 1st, 2nd, and 3rd place will head home with prizes generously donated by MARAC/NEA Spring 2015 vendors. ** There will be Pub Quiz sign-up sheets at the registration table and at the reception, so sign up early and ready your brains for some fun trivia! Looking forward to seeing you all in Boston later in the week! *Plan ahead and prioritize your sessions! Schedule available on NEA and MARAC websites. **Big thank-you to Backstage Library Works, BiblioLabs, LLC, Colorlab, Society of American Archivists, The Crowley Company, and University Products for generously donating Pub Quiz prizes. I first met Sands Fish at an MIT New Employee meetup three years ago. It was at the Muddy (an MIT graduate bar) and I remember being nervous going to such an event, being new to campus and the MIT world. I was met by a big smile and a general enthusiasm for the work archivists do that both surprised me and put me at ease. Here was someone who knew what an archivist was (no elevator speech—yes!) and was actually engaged in the work we do. Sands’s enthusiasm for archival work remains apparent in his work with some of the most forward-thinking groups in research and media. He is a senior member of the Media Cloud research team, and although not an “archivist” his work and research centers around a large archive of online media. As a fellow at the Berkman Center and a Research Affiliate at MIT’s Center for Civic Media, Sands focuses on “data visualization, semantic web technologies, linked open data, information architecture, and their application to education and civic media.” As technology has revolutionized the way we create, share, and receive information, Sands is trying to bring some of that revolution to how we collect and manage these new torrents of information. Sands’s Saturday plenary talk will discuss the work he does at the Berkman Center, explore the traditional concept of the archive and what it would look like in a networked world, and examine the definition of the archive outside of the profession and what that means to the archival profession itself. Let’s all meet him with a big smile, welcome him to the archival world, and engage with him in the work that he does! Creating a program for a conference is one of the best jobs. At least I think so. This is my 4th MARAC program committee and the 2nd I’ve lead as co-chair and each one has been different. For years MARAC PC members were the program drivers: we came up with session ideas, and identified and invited speakers. We’re moving away from that model. We are asking for session proposals and these proposals now drive the program; however, as Geof Huth, PC co-chair for Rochester, said while we were planning the program for that meeting, MARAC members have yet to take ownership of their conference. MARAC’s Meetings Coordinating Committee appointed an ad hoc committee to study conference participation and programing development. From the ad hoc committee, and recently adopted by Steering, comes the requirement at that all future PCs will put out a call for proposals. This is great – although most past PCs have been doing this. NEA also puts out a call and then the committee fills the gaps. For Boston we put out a call, had a nifty Google form for submissions (thanks to Susan Kline, PC co-chair for Rochester! ), and, created a listserv so that NEA & MARAC would have a forum to discuss ideas. Some of the submissions were fully formed — interesting topic, speakers identified — but some, well most, needed work. So, how to craft a session proposal? I’m not sure I have answers, but if you’re interested in presenting at a future conference, join us on Saturday for the Lunchtime Discussion on Crafting a Session Proposal. We’ll have an informal discussion and on hand will be past, present, and future NEA & MARAC Program Committee chairs. The Museum of Fine Arts in Boston is all classic architecture. The MFA originally opened its doors in 1876 in Copley Square. Thirty three years later, the museum moved to its current home on Huntington Avenue. In 2010, the museum completed a new wing to house its American Art collections. The museum is host to many different exhibits, contemporary and historical. Some current highlights include the visiting masterpiece, Gustav Klimt’s Adam and Eve; Nature Sculpture, Abstraction, and Clay: 100 Years of American Ceramics; and Planes, Trains, and Automobiles. The museum also has a great collection of Asian Art, currently featuring an exhibit entitled Court Ladies or Pin Up Girls? Chinese Paintings from the MFA Boston. This exhibit includes paintings, prints, posters and photographs, dating from the 11th through to the 20th century. In recent weeks, a collection of Nazi-looted art, which was originally owned by the Rothschild family, and was recovered by the heirs, has been generously gifted to the museum. The collection consists of 186 items, and ranges from paintings to furniture to decorative arts, and jewelry. The MFA Curators address the issues of Provenance and ownership history of the items. More information on these exhibits, plus other currently on display, can all be found athttp://www.mfa.org/exhibitions. If the MFA is classic-styled art, the ICA is modern. The Institute of Contemporary Art is located near the Seaport District of Boston, and is easily accessible by the silver line. Their current special exhibit is When the Stars Begin to Fall: Imagination and the American South. The Boston Globe calls this exhibit “provocative, a volatile mash-up, alive to recent art history and laced with surprising connections.” For more information, please see http://www.icaboston.org/exhibitions/exhibit/when-the-stars-begin-to-fall. The Harvard Art Museums, just across the river in Cambridge MA, have only recently re-opened under a mass renovation project. Now under one roof, these museums display a wide variety of art from European to Asian to American. A few of the ‘special’ collections include, Ancient Mediterranean and Near Eastern Bronzes; Gordon Wahd Gahan photograph collection; and Prints and Pursuit of Knowledge in Early Modern Europe. You can find more information at http://www.harvardartmuseums.org.